The particular charism of the Carmelite monks rests upon four pillars that are essential to their identity. The first pillar is filial union with the Blessed Virgin; the second, the Rule of St. Albert; the third, the extraordinary form of the Carmelite Liturgy (i.e. the Rite of the Holy Sepulcher and the Church of Jerusalem); and the fourth, the spirituality and way of life of St. Teresa of Jesus and St. John of the Cross. Each pillar is equally important in supporting this charism, and without each pillar this charism would cease to exist. 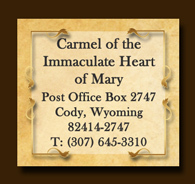 An ancient saying in the Carmelite Order states: Carmelus totus Marianus est, that is, "Carmel is totally Marian." The Holy Virgin permeates the whole of the monks' lives by her living presence in the midst of their brotherhood. "She is truly their life, their sweetness, and their hope; their source of kindliness, their sister, their friend, their dove, their immaculate one, the love of their hearts. Indeed, she is their heart and soul." She is, likewise, the true foundress of this new community. Just as a founder bequeaths his charism to his sons, so our Lady has communicated her spirit and charism to her Carmelites. These Carmelite monks are impelled by their love for her to imitate her virtue and continue her mystical apostolate of mediating grace to souls through their union with God.